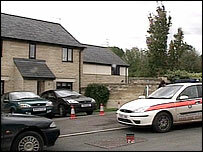 A mother and her three-year-old son found dead at a house in the Cotswolds died from carbon monoxide poisoning, post-mortem examinations have revealed. Police were called to a house in Otters Field, Greet, near Winchcombe, on Friday where they found the bodies of the 36-year-old woman and the child. Ch Insp David Peak said: "We are investigating the circumstances surrounding this very tragic incident. "However no-one else is being sought in connection with this inquiry." The identities of the mother and son have not been released by police.